Instagram has always been a social network where you follow friends and creators, but today it’s evolving with a new way to follow hashtags so you see top posts and Stories about a topic on your home page. Rather than having to dig this content out of search or the Explore tab, you can see the best #Slime videos or #FloralNails tutorials no matter who posts them. Today’s change will require some smart filtering by Instagram to prevent objectionable content or spam from being distributed by hashtag following. But it has the potential to help users see beyond their own social graphs and dive deeper into niche communities they care about, making Instagram more endless. 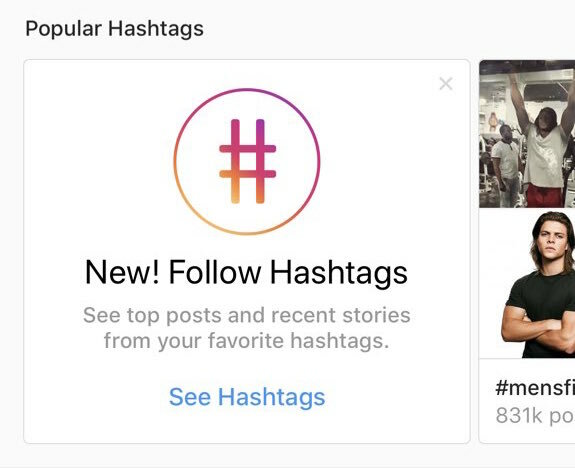 Eventually, hashtag following could give the app more powerful ad targeting data and an opportunity to show more interstitial ads between Stories, but the company says it’s not doing either right now. Instagram was first spotted testing hashtag following last month by Pippa Akram and The Next Web. Today it rolls out to all users, who will see a Follow button on hashtag pages they reach through search or clicking on one of the tags. We asked Instagram how posts get chosen to be shown to a hashtag’s followers, and learned that Instagram algorithmically selects the best ones based on factors such as recency and quality. That means just because someone punches in a ton of popular hashtags on their posts doesn’t mean you’ll necessarily see them unless they’re great. You’ll also be able to effectively downvote posts you didn’t want to see from hashtags with a drop-down menu in the top-right corner. To weed out spam and objectionable content, Instagram will use automated and manual systems for flagging inappropriate posts and blocking their authors. Hundreds of people on its community operations team will be monitoring user and automated reports to review content 24/7. The company says that over the past few months it’s made improvements to how it sources and ranks hashtag content to ensure what’s shown on hashtag pages is safe, and uses large teams to analyze hashtag trends. Instagram’s hashtags are another expression of Facebook’s new overarching mission to “bring the world closer together.” Like Facebook’s Groups, hashtag following lets users explore outside of their own social bubble. Whether you friends have different tastes than you or you’re just sick of their selfies and sunsets, hashtag following will let you customize your experience to make Instagram your window into whatever world you want.